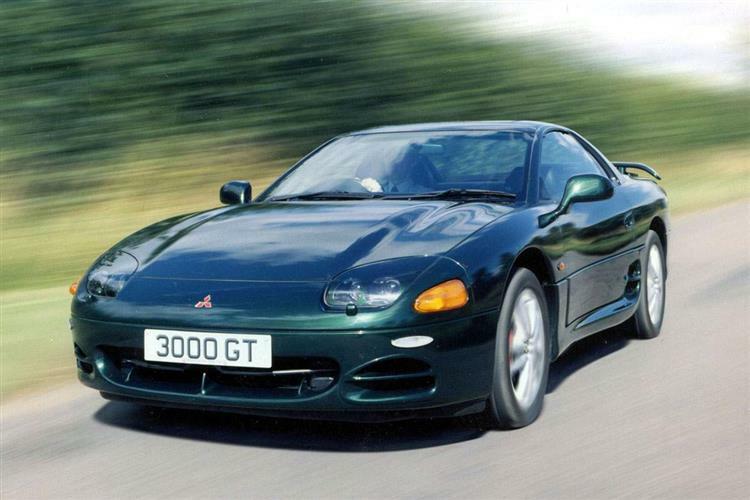 The Mitsubishi 3000GT represents a case study in technological overkill. Whilst some rivals used a technological sledgehammer to crack a nut, an apt image for the 3000GT would be a small peanut perched atop a hundred-megaton thermonuclear device. It was almost as if there was a momentary lapse of reason at Mitsubishi in the early nineties whereby development engineers decided to throw every driver aid and gizmo they could think of at one particular car. All this technology doesn't make the Mitsubishi a bad car; it just makes it an incredibly complex and consequently risky used buy. If you can bag a good one, and there are a number of good cars about, a 3000GT is probably the best car for the money to cross continents. A sports car? You'll have to look elsewhere for that. The 3000GT was unfairly compared with other techno-laden sports cars such as the Nissan Skyline GT-R, whereas it was probably best viewed as a cut-price successor to Porsche's 928 in spirit, if not in execution. Due to these comparisons the big Mitsubishi was branded as a bit of a dynamic duffer, and as a result can be picked up very reasonably on the used market. These misplaced conceptions can save you a lot of money. The Mitsubishi 3000GT was part two in a series of four leviathan Japanese super-coupes. The Nissan 300ZX debuted first in 1990, followed by the Mitsubishi in 1992, with the Mazda RX-7 Twin Turbo hot on its heels. A year later Toyota's mighty Supra twin-turbo arrived with performance that wiped the floor with all before it. To put these models into perspective, the Toyota was the quickest, the Mitsubishi the most relaxed GT and also the most expensive. The Nissan made a good case for itself as the bargain compromise whilst the Mazda RX-7 was by far the rawest and prettiest. In its early guise, the 3000GT featured pop-up headlamps, a 282bhp twin-turbo engine. It also had four-wheel drive and four-wheel steering. In October 1994 the big Mitsubishi benefited from a facelift. Pop-up headlamps were seen as increasingly passe, and faired-in fixed lamps were fitted to the new-look nose. The rear lights received some attention too, and redesigned alloy wheels made an appearance. In August 1996 Mitsubishi recognised the car's relaxed nature by fitting a six-speed gearbox with a lazy overdrive top gear for effortless high-speed cruising. The final round of changes came in October 1998 when yet another design of alloy wheel was fitted, attractive stainless steel door kickplates were added and the excellent Phillips Carin satellite navigation system was fitted. Although the 3000GT is a big, heavy car, it seems that a higher priority was given to packaging the processing power than the people. Headroom inside is tight for anyone over 5'10", especially if fitted with the sunroof that robs two inches of clearance. Couple this with a firm ride and the taller driver will need to slump in the seat and strap something slim but soft to the top of his head. Luggage space is also notable by its absence, the huge rear hatch opening up to reveal a loading bay that would only take light weekend bags. Whilst it's billed as a 2+2, the rear seats in the Mitsubishi are really only suitable as additional luggage spaces. Expect a call from the NSPCC if you plan to put children in the back. Naturally, performance and roadholding are excellent, but the laws of physics will only stretch so far. The 3000GT weighs 1740kg, or to put it another way, about the same as a Volvo V70 estate and a big-boned sixteen-stone driver. It drives like a powerful saloon, so don't expect hot-hatch nimbleness. The early car's looks haven't dated very well, the rather clumsy detailing having been deleted for the models with fixed headlamps. These still look striking, but bear in mind that the super coupe bar has been raised since 1991, and the Mitsubishi hasn't changed considerably under its skin. In short everything. Although the 3000GT is built to Mitsubishi's usual high standards, with this many complex systems on board the law of probability dictates that something costly will go wrong. Whilst this may sound like Luddite scaremongering, it's best to take an expert when you check out a 3000GT. You'll need to ensure the car hasn't been accident damaged, that it's HPI clear, that it's a proper UK car and if not has the necessary paperwork. Cars that are too cheap to be true are priced that way for a reason. Be suspicious. The big Mitsubishi is available in reasonable numbers so you can afford to be picky. (Estimated prices, based on a 1998 3000GT) Remember the look on Frank Bruno's face the second time he climbed into the ring with Mike Tyson? He foresaw the almighty leathering he was about to receive and that's how a 3000GT owner's wallet feels when something gives up the ghost. Light swelling will result from front brake pads at around £67, rears at £50 a pair and a new clutch assembly at £160. A new starter motor at around £330 and a radiator at £415 will definitely warrant a standing count, while a sickeningly woozy sensation is brought on by bills of over £700 for an exhaust and over £500 for an alternator. The final KO is dealt by a £700 bill for a replacement headlamp. That's got to hurt. Put the Mitsubishi 3000GT into a fast bend and you can feel the sheer weight of all that technology gluing you to the road. The four-wheel drive system guarantees traction off the line, although don't expect it to give great traction in muddy or snowy conditions due to the enormous tyre footprint. Four-wheel steer makes long sweepers seem effortless and the car's stability is genuinely good. The ride is firm, but the electronically-controlled damping means it never becomes harsh or crashy. Active aerodynamics are part of the display too, with spoilers that advance and retract according to the car's speed in order to create a 'venturi' effect. This creates a low-pressure zone under the car, effectively sucking it to the road. On the road, first feelings are good; the 24-valve V6 revs with a deep-seated howl. It goes too. Sixty takes 5.6 seconds on the way to a top speed of some 155mph. And because the power is achieved courtesy of a twin turbo arrangement, there's no turbo lag worth mentioning. On those twisty B roads, the big Mitsubishi feels accomplished enough, without making the mistake of trying to handle and ride as roughly as a hot hatch. If your object is simply to get round the bends with the minimum fuss and the maximum speed and security, then the 3000 GT is a good bet. It isn't just about grip either. The steering is well weighted and position, the power response instant and the turn-in razor-sharp, enabling you to deploy all two hundred and eighty one horses without drama. 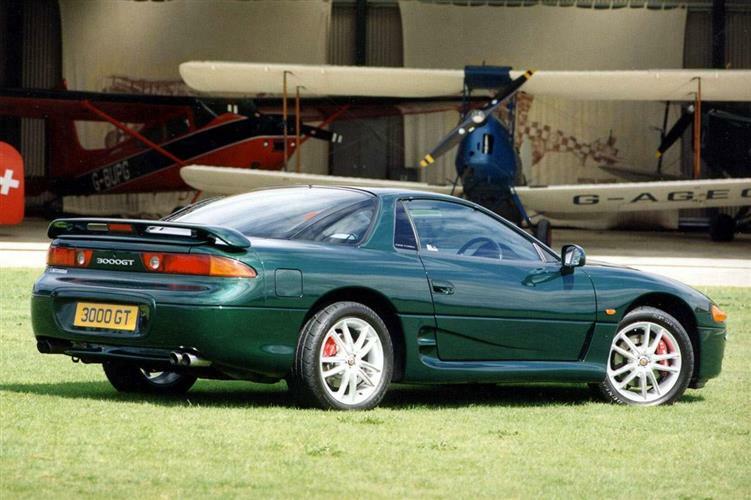 Despite the many attributes of the Mitsubishi 3000GT, the plain fact is that judged as a sports car there are many better alternatives available for less money. If you are sold on the technological prowess or love the way it looks, then if you're careful about buying and can afford to run one, the big Mitsubishi represents a capable, if dated, GT car. As an intercontinental ballistic missile, the 3000GT has few peers; just be prepared to travel light.